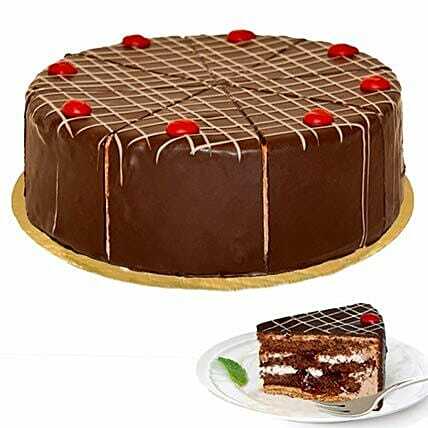 Handmade confectioner cake with real blackforest cherry water and soft base. The cake weighs aprox. 600 g. and has a diameter of 16 cm. The cake is delivered in a fail-safe gift box. The chosen delivery date is an estimate (sometimes with a delay of 1 business day, although very rare) and depends on the availability of the product and the destination to which you want the product to be delivered. Please provide the name on the doorbell while placing the order. Since cakes are perishable in nature, we will be able to attempt delivery of your order only once. The delivery cannot be redirected to any other address. "Excellent support and product._x000D_ "
"Initially I was highly doubtful if ferns n petals could deliver in time, for my abroad order. But now I cn say, I cn place trust in them every time. " "It's was pretty good. The delivery was prompt and client servicing was good." "Very much appreciated and excellent service with quality product"